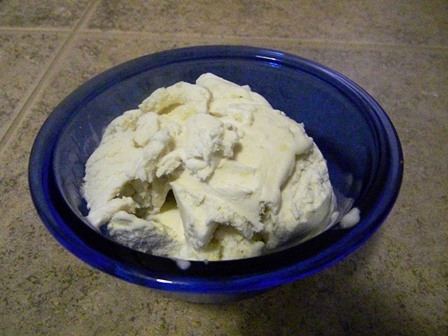 When I was growing up we used to make ice cream on Independence Day. This year I decided to resurrect the tradition. Since I can’t have ice cream, I decided to go for a higher fat frozen yogurt than I have made in the past. Usually I use 2% milk, or sometimes whole milk, but this time I decided on a mixture of half & half and whipping cream to make my yogurt. This was actually a three day process, but well worth it. This was probably the best (and most ice cream like) frozen yogurt I have ever made. Saturday morning – I made the yogurt using equal parts half & half and whipping cream. Sunday morning – after the yogurt reached the 24 hour mark I took it out of the yogurt maker and refrigerated it for a few hours. Sunday afternoon. I put about half of my yogurt in the strainer and put that in the refrigerator (I have read you don’t have to refrigerate the yogurt when you are straining it, but I like to). I also put the three bananas (whole and unpeeled) in the freezer. Monday morning – I took the strained yogurt out of the strainer and set it aside (in the refrigerator) for later. It was about as thick as cream cheese. I put all but about a cup of the rest of my yogurt in the strainer and put that back in the refrigerator. I took the bananas out of the freezer to thaw. This is a trick I learned from Food Network’s Alton Brown. Freezing and then thawing the bananas brings out the flavor. I put my ice cream maker container into the freezer. Monday afternoon – I scooped the second batch and the original batch of strained yogurt into my Kitchen-Aid mixer bowl. Then I added the banana, honey, and vanilla. I mixed them at a high speed for several minutes (to allow the yogurt to whip up a little bit). Then I poured the mixture into my ice cream freezer and added the walnuts. I churned it for about twenty minutes. For the first time since I have been making frozen yogurt my ice cream freezer stopped churning on its own, meaning my frozen yogurt was nice and thick.